Heritage Industrial Services (Heritage) – was recently hired to perform the rigging of various naval artifacts from the New Jersey Naval Museum located in Hackensack, NJ. The project consisted of the rigging, loading and transportation of the artifacts from the Hackensack, NJ facility to the Washington Navy Yard located in Richmond, VA.
After Hurricane Sandy made landfall in 2012, the museum suffered severe damage and was closed to the public. The artifacts were deteriorating due to the lack of proper environmental conditions and several artifacts that were displayed outdoor suffered severe damage. The decision was made to close the museum and remove the pieces to prevent further deterioration. Artifacts that were removed included a Regulus 1 SSM-N-8A, the Navy’s first operational cruise missile, Regulus 4 w/ Wheel Trailer, Germany Seahund Submarine, Japanese Kaiten II Submarine, Patrol Boat, Conning Tower, PBR, (3) misc. Periscopes, Mine, MK 16 Mod 1, Anchor, Sub-Propeller, Bofor Gun, Missile Guided Terrier, SAM-N-7 / RIM-2, SN D115, Navy US Guided Missile, Talos SAM-N-6/RIM-8/MK 11 MOD 0 with booster and a Navy US Model Missile Polaris A-1. In addition to the above artifacts, Heritage Industrial Services also provided engineering and fabrication of (1) mobile stand for the Kaiten II submarine. Careful planning was performed prior to the project starting, including critical lift and rigging plans for each crane pick and necessary coordination on site to make sure that each crane pick was done safely and without harm to the priceless items. 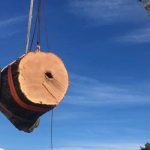 The artifacts were rigged and lifted utilizing a 120-ton hydraulic crane, 12K Telescopic Lull, associated rigging gear and a 4-5 man rigging crew. The recovered artifacts were returned to the Washington Navy Yard where they will be assessed and receive as needed restoration. Once restoration is complete they will be put back on display in the future for the public to once again enjoy. The project was completed safely, on schedule and without incident. Heritage Industrial Services performs nationwide rigging, machinery moving / installation, millwright and dismantling services. We are a Small Business Enterprise (SBE), approved in ISNetworld ID # 400-223128 with a Grade “A” rating and are bondable. Safety is a priority on every project as well as quality control and adherence to all specifications and budgetary goals. Our OSHA trained and experienced crews can handle all types of demanding / technical projects, from the smallest single piece of equipment to entire plant moves and dismantling projects. A “History of Quality and Dedication” is what separates us from others.